With its ALPHA 500 carpet weaving systems of the product line Schönherr carpet systems, Stäubli supplies high-performance machinery to the world’s leading carpet producers. These highly flexible machines enable the production of a wide variety of carpets, from modern cut-pile to artificial turf, ultra-high-density rugs, and wall-to-wall applications. Schönherr carpet systems is a trendsetter in binding technology, and this will be evidenced by the latest carpet samples on display at Booth G43 in Hall 6 at Domotex in Hannover, including vintage carpets with a realistic used look, outdoor carpets, and much more. Modern, used-look carpets remain a strong trend, till now mainly in tone-on-tone, but this year also in high-contrast color combinations. Until recently, weavers of machine-woven used-look carpets have lacked the means of creating real, flowing transitions that give the appearance of unevenly worn spots on the carpet. But now, using Schönherr’s new binding technology Magic Weft Duo (MWE Duo), designers can create designs that include “faded out” areas. This is done by weaving a gradual transition from 100% cut pile to a pure weft pattern, creating areas with a “thinned out” pile. This binding technology also enables additional color effects by combining up to 12 cut pile colors and up to 5 weft colors per gripper. This allows carpet designers to set extraordinary color accents and carpet producers to serve an expanded market. Today, carpets are used not only in living rooms and bedrooms but increasingly outdoors too, to enhance lifestyle. Outdoor carpets are ideally weather-resistant, UV stable, and easy to clean. Thanks to a wide choice of weave structures, woven carpets can be designed to reduce water absorption and dry quickly. Binding technologies thus help meet requirements for weather resistance and cleaning. With its flexible ALPHA 500 series of weaving systems, Stäubli allows carpet mills to follow the trend of outdoor carpeting, economically producing good quality while benefitting from high productivity. A wide range of options for color combinations using pile and/or weft yarns allows carpet mills to delight their markets with astonishing designs. 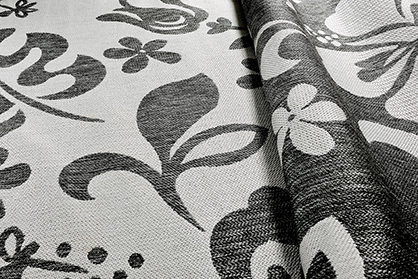 Established binding technologies such as REVERSE (carpet back is the negative of the front, and both sides can be used) also help carpet manufacturers stand out from their competitors and offer carpets that bring living space outdoors. And apropos nature, woven outdoor carpets are ideally produced from a single material (e.g. PP) and are thus fully recyclable.